Born in Buffalo, New York, Todd Russell has studied capoeira for the past 15 years. Russell graduated from Capoeira Mandinga, under the supervision of Mestre Marcelo Pereira, in the first international capoeira event; taking place in August of 2006 in Ubatuba, Brazil. 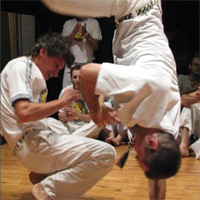 Russell has been promoting and presenting capoeira through performing, teaching and providing his knowledge and expertise within this Brazilian art. In October of 2004, he founded the Academia com Expressão, a professional company for capoeira that has performed and offered workshops throughout the United States and abroad, including classes within the Department of Movement and Dance at the University of Rochester; working with Sankofa in Brockport, NY; Pixar Animation Studios in Berkeley, CA; and various groups in Brazil, Japan and China. Russell currently holds classes throughout the year within the greater Rochester area.